I discovered a very cool way to make caramel sauce in a slow cooker and it is so easy. 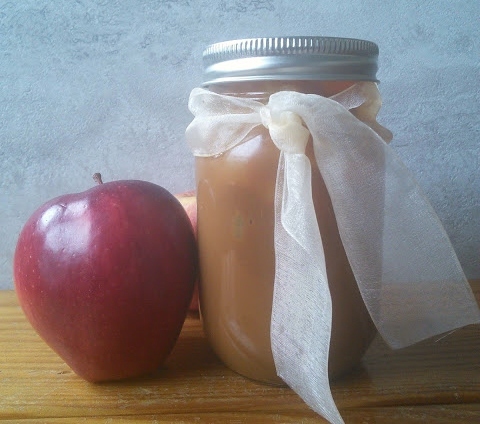 This caramel sauce tastes wonderful with apples and makes a great gift. All you need is a can of sweetened condensed milk (the sweet one not evaporated milk.) You place the unopened can in a slow cooker and fill with water to cover the can. I also placed foil at the bottom on my slow cooker to prevent rust stains. For best results do not buy the condensed milk with a flip top. You can also use fat-free condensed milk. Place the lid on the slow cooker and cook on low for 8 hours. Then take the can of sweet condensed milk out of slow cooker(use tongs as it will be hot.) Then let it cool for 2 hours. When you open the can of cooked condensed milk, you will discover a sweet surprise. It is amazing that the can of milk turns into a wonderful caramel sauce. The caramel sauce needs to be stored in the fridge and it keeps for about two weeks. This delicious caramel sauce is great with sliced apples. Here is how I served mine. This sauce would also be great with ice cream or apple pie. I once made a pear crisp with it and it was delicious. This creamy caramel sauce also makes a great gift. Put the caramel sauce in a mason jar or any other container. 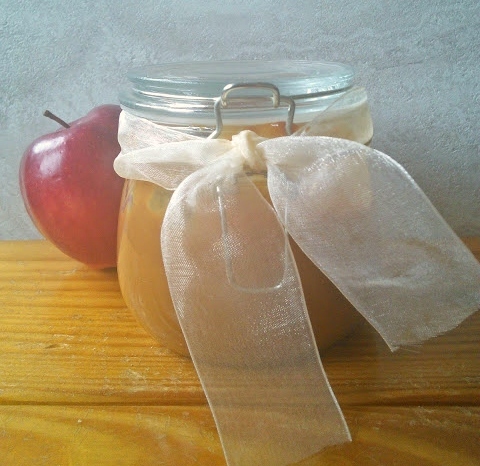 Place a ribbon on the jar and pair it with some apples. Just let the person know they need to keep it in the fridge. This caramel sauce will keep for two weeks in the fridge. Place the unopened can condensed milk in the slow cooker that has a sheet of foil on the bottom. Add enough water to cover the can of milk. Place the lid on the slow cooker and cook on low for eight hours. Then remove the can of milk from the slow cooker with tongs and let it cool down for 2 hours before you open the can up. This caramel sauce is great with sliced apples and can be used in recipes. Thanks for sharing. I love caramel with my apples. That is genius! Not to mention way cheaper than constantly buying caramel! Yummy! I love apples with caramel and condensed milk makes everything so much better! Wow, I never knew this could be done. I always worry about burning the sugar in the pan, so now this will be my go-to!! Thanks!! Great idea! Definitely have to try it - and I'm sure it's cheaper than the usual caramel sauces! Yum! Looks delicious! Caramel Sauce and apples are one of my favorite fall combos. Easy, awesome, and yummy! This is great! Guess what I'm doing later! I had no idea this could even happen... yum! Oh wow! How easy! I LOVE caramel, so I will be trying this recipe very soon. Yum! I'm ready for some apples and caramel sauce. Thanks for sharing!! Yummy! I want some homemade caramel sauce. I need to make this. That looks so yummy and so easy to make! Will definitely bookmark this for the future! Oh my goodness. This looks curious and very yummy. I am addict to carmel in any form. Look awesome and yummy and not hard to make. I thought there isn't any easier way to make caramel sauce. Turns out I was wrong. This is awesome! Thanks for the idea. I've been using my crockpot more lately. This is going on my list of tasty things to make. I love caramel sauce, but I always made it from scratch. I will have to try this. Yum! This sounds delicious, and probably much better than buying it from the store. How did I not know about this before! This will be awesome for Halloween! WHAT?! No way! I had no idea it was this easy! I had no idea that you could make caramel sauce in the slow cooker. I should have known, though. You can make anything in it. This looks yummy! Im going to have to do this instead of buying caramel sauce, such a great idea! I love dipping my apples in caramel, too. This is such an easy and great idea!! I must try it.